With Spot Buddy you can share your travel route with friends, family, and coworkers. 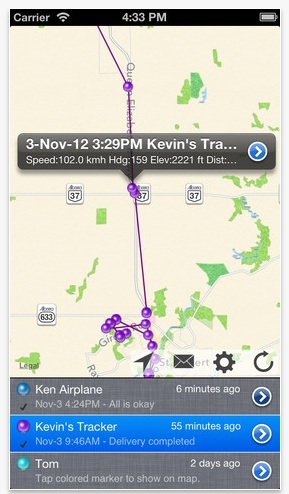 You can also view SPOT Satellite GPS Messenger tracks. Spot Buddy is the only app that can view route details from several different types of GPS trackers, all on the same map, at the same time! – View tracking details from multiple tracking systems including Spot Buddy and SPOT Satellite GPS Messenger. – View multiple GPS trackers on the map at the same time. Keep watch on a group or fleet. – Maintain a list of GPS trackers of friends, family, and coworkers. With the tap of your finger, you can zoom to their last known position on the map and visually see their route details. 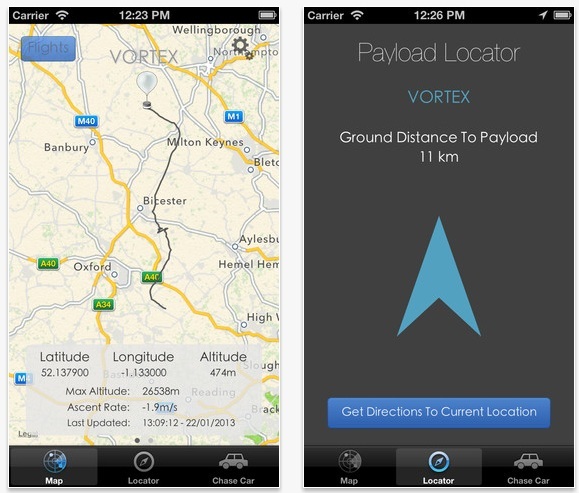 – Speed, distance, and heading between GPS points are automatically calculated. – Speed and distance can be viewed in statute miles, kilometers, or nautical miles. – Easily share your list of trackers with other people or receive a list from others using email. Spot Buddy features a built-in GPS tracker that you can use to share your travel route with family, friends, or co-workers. With the tap of a button, Spot Buddy will send your GPS position to the Spot Buddy service at 3 or 10 minute intervals. Then they can view your travel route on a map. You can even send check-in messages to let them know how your trip is going. If you prefer to keep your location details private, you can give your tracker a password so that only people you trust can follow your location. Spot Buddy only turns on the GPS for a short time to accurately determine your location then goes to sleep to conserve battery power as much as possible. For long trips, try to plug your iPhone or iPad into external power. Sleep mode can be disabled while using the built-in tracker for uninterrupted tracking. At 25% battery power, sleep mode is enabled again to prevent the battery from being fully drained. The Spot Buddy location tracker is simply the easiest tracker to use in the app store. Give your tracker a name, set an optional password, tap the start tracking button and away it goes. No registration forms or complicated setup required! – View more than one SPOT track on the same map. It’s great for tracking groups or your fleet! 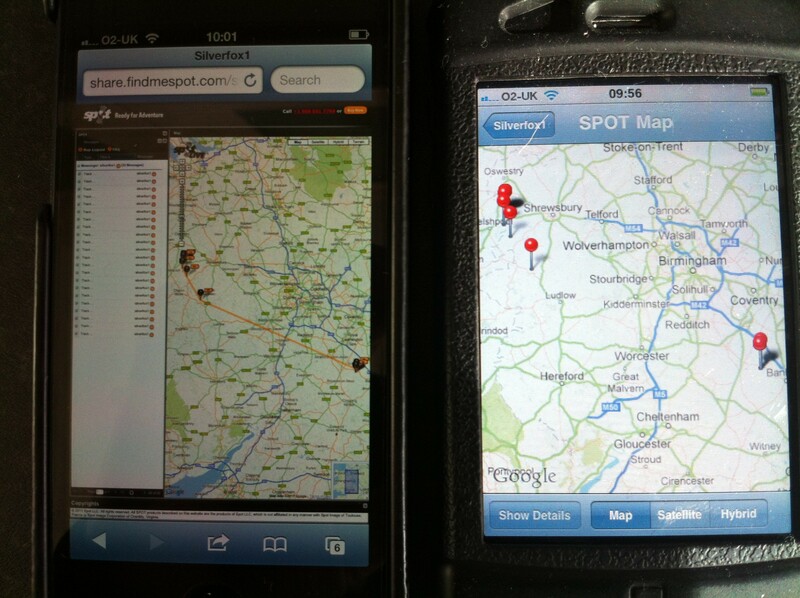 – Spot Buddy uses the built-in iPhone/iPad map features that are much faster than the map used on the SPOT Shared Page website. Scrolling with your finger and pinch-and-zoom are all built in making map use a breeze! – View SPOT check-in messages. When a SPOT user presses a check-in button on their device, you see the message in Spot Buddy. – View both public and password protected SPOT tracks (knowledge of password is required). My experience of SPOT Buddy on the go is mixed. 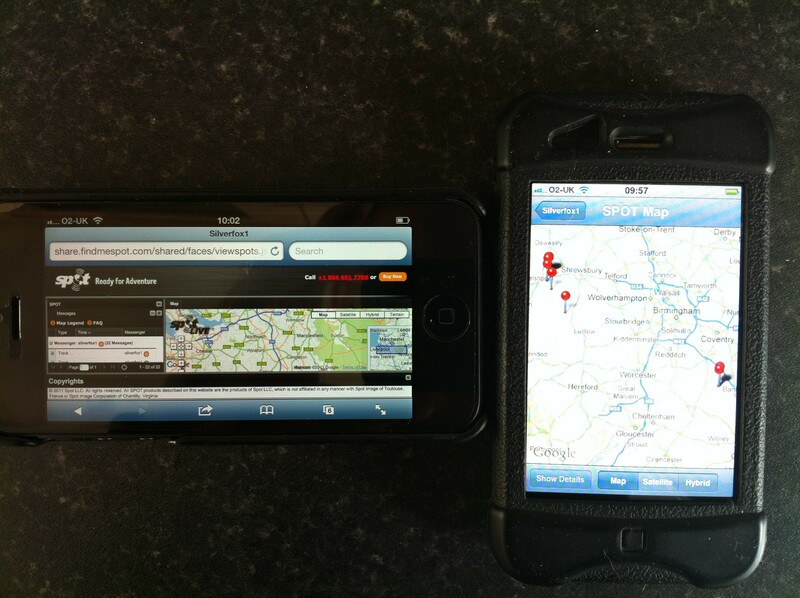 There is a great advantage tin having two or more device tracks shown at once. The display is OK on a phone size screen but works best on the Ipad. I used it to track two SPOTs on a payload and one chase car. It worked really well when I could get a wifi connection but out in the sticks, when there was only 3/2g cover, the app ground to a halt on several occasions. The SPOT Shared Page app was much better; as it may have had a smaller amount of data to download. The SPOT Buddy app can also let you down the day after your flight. My experience is that the tracks are no longer displayed after several days; while they are still visible on your SPOT shared page. This is what I think. Normally when I review an app I go to the trouble of buying it and giving it a thorough run through. Not in this case. I went by the screen shots and creators details. Firstly the SPOT tracking function. This function looks simple enough. Clouds Below only offers single SPOT device tracking at any one time, putting it at a disadvantage to apps like SPOT Buddy which let you track multiple devices at any one time. Burst calculator. Without any explanation about how calculations are made, the burst altitude, flight time and gas volume calculated are pretty meaningless to me. I also don’t use gas volume when filling my balloon but calculate a ballast weight to be lifted by the balloon. 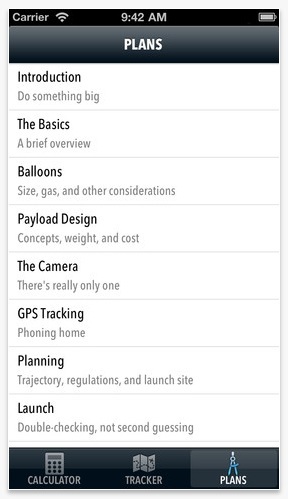 With information on how to choice a balloon, or calculate the burst altitude freely available from the UKHAS web site I don’t’ see any point in putting it in a mobile phone app. Plans. I really don’t feel like buying the experiences of this HABist and reading them on an app. There are plenty of HABists who have published their experiences on the web and I am more inclined to read those. In conclusion I would not recommend that you buy this app. The only thing I see of any use is the SPOT tracker and there are better SPOT tracking apps available. The landscape view of SPOT LLC’s SPOT shared page is even worse. HAB HUB is a tracking app for radio beacons on HABs. 1) A simple spacenear like tracker – showing 1 balloon at a time and giving a read out of lat/lon/altitude below. Swipe that data box to the left and you’ll get an altitude vs time graph of the flight. Currently the list of payloads includes test and live data. 2) “Payload locator” – a bit of fun. Displays a big arrow pointing where the payload currently is and tells you how far away it is. Button at the bottom gives you turn by turn directions to the payload (via Apple Maps). 3) Chase car tracker – hit the switch at the bottom to begin uploading your location data to habitat. This will run in the background until you open the app and switch it off. Settings for this can be found on the map page (top right cog wheel). There are a couple of bugs in v1 – I have uploaded v1.1 to fix these (hopefully!) but who knows how long Apple will take to review – usually around a week. iPad support is on it’s way but is not present in either v1 or v1.1. HABHUB is now available on a web page designed for all mobile devises browsing the web. 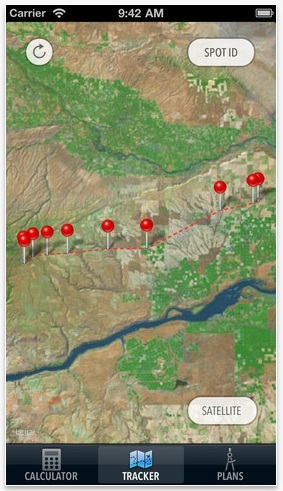 1) A simple Spacenear.us l tracker – showing multiple balloons and chase cars. The balloon display includes ascent rate, max altitude, coordinates, geofence, satellites, status, and TSLF (what ever that is!). 2) Chase car tracker – two simple switches turn your device into a mobile tracker displaying a unique call sign. Given this is available free and has all the features of Adam Cudworth’s app, this is my choice.